I was not planning on doing a blog shoot while I was in Nashville. But Nick and I met, we liked each other’s style and we had some time. So a shoot was born just before I flew back home. Not gonna lie, you guys. I was intimidated about putting together outfits for a shoot. Usually I have my whole closet to build something. This time I had to cobble together two unique outfits from my suitcase. With a new photographer (who is, quite frankly, exceptionally good at his craft) no less. It was probably the most unnerving thing I experienced all week! But this is where my pre-trip planning came in really handy. When I think about what to pack for an extended trip, I try to build multiple ensembles with individual pieces and/or stay within a color palette to allow for easy mixing and matching. 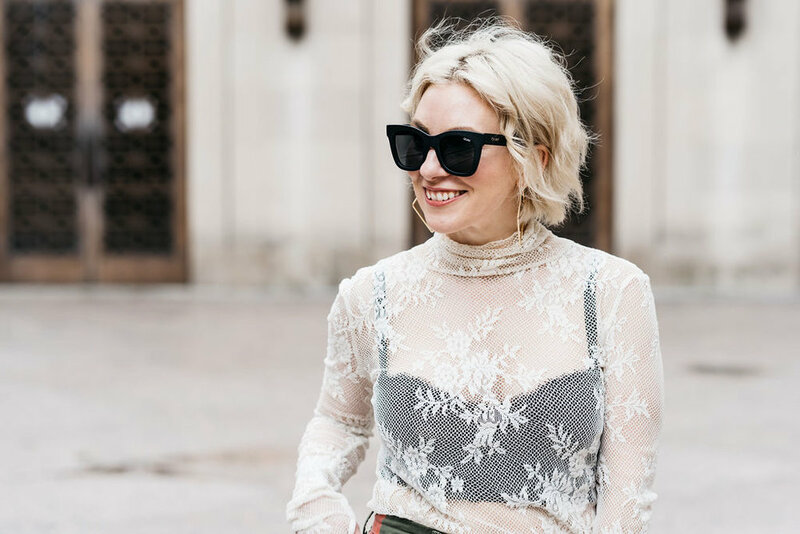 So for example, this lace turtleneck was layered under a black slip dress and cropped black blazer for one of my pre-conference days. Check it out below. It looked way more conservative layered up that way. But because everything I brought was in a certain color family, it didn’t take much to build a completely different outfit around this top. I cheat just a little. The bulk of what I pack is neutral (black, white, cream, grey). But not everything! I brought this colorful skirt and this (AMAZING) dress. Both of those pieces injected just enough vibrance into the otherwise simple collection. The key to feeling covered with your selections is to map everything you plan to wear before you pack. The first thing I do is write a list of the things I want to bring and the days/events for which I plan to wear them. Then I lay everything out on the bed and make sure I’m digging it all when I see it in front of me. These two extra steps take the stress and guess work out of packing. I have felt completely prepared when I travel after implementing this process. I’m always looking for ways to be a more sophisticated traveler. So, tell me… do you have any packing hacks that help ensure a smooth trip? *I have talked about putting together a How-To for packing a week’s worth of clothes in a carry-on. I’ll make that a priority!